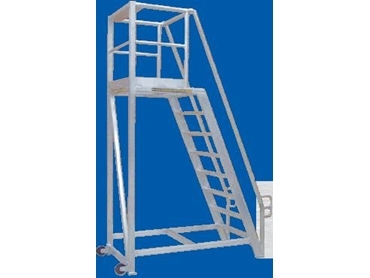 The No Bolt Work Platform is a safe and strong access solution available for a range of applications and industries. With No Bolt’s high standards of aluminium manufacturing and input from the market comes a product that answers the need for ease of working at height with safety. The No Bolt Ladder Platform comes in a variety of platform heights from 600mm to 3000mm, or special units can be constructed to suit individual applications. NBLP5 with walkthrough exit - Suited to the mining, transport and storage sectors, as the platform allows safe access. Custom built and welded in structural high-grade aluminum with variations in platform work size, area, height, width and mobility requirements.